Our final day of our Alaska Adventure and as we wake, Seattle, Washington is in sight as well as the Space Needle. Time for us to catch some breakfast and get ready to disembark the ship. Before we do this, one last look at our navigation to see how far we have traveled now that we are in port. We will head up to Queen Anne Hill at Kerry Park and catch a view of the Space Needle. Note the ORANGE top of the Space Needle as it’s the 50th Anniversary of its construction and they have painted it back to its original color. We will briefly stop at Occidental Park for a few shots and also catch a shot of the Waterfront Street Car station that is here as well. While our bus made it’s way through the city we passed the old King Street Station that was the depot for the Great Northern Railway and Northern Pacific Railway. Currently there is a King Tut exhibit going on so the temporarily adjusted the station sign to read King TUT Street Station. It was impossible to get a clean / complete shot of the station while on the bus but here is a couple of shots from different angles we did get. Another prominent navigation feature we spot is the Race Rocks Lighthouse that we can tell we are being navigated around and for good reasons as there are lots of rocks over there that could sink a ship even as big as ours. As we navigate into the harbor we also spot the Ogden Point Breakwater Lighthouse. Now get this, if you have been following this Trip Report you know just how HUGE our cruise ship is. With all the other Ports of Call we pulled gently aside a dock; but, this time the Captain with “Back” into this narrow cubbyhole with little room to spare on either side and stop within just a few yards before running into the awaiting buses. I will take this shot from the deck on the back of the boat as we slowing back into our parking spot! Once in port we board a bus to take us to Butchart Gardens which is 55 areas of a stunning floral gardens. This is a place we will also look forward to coming back to some day. Here are just a taste of what you will see at this wonderful place. We will also get treated to a unusual Fireworks display after sunset that tons of folks also come to the gardens to see. I tried to pull a few stills from the video I took of it just to give you a feel for this display that was well worth the time to watch. With the Fireworks over we head back to the bus and head back to the ship as we will be pulling out of Victoria shortly for our final stop back in Seattle, Washington when we started a week ago. Time to start the day and peek outside to view the morning sunrise and catch some navigation info. Lisa and I will spend some time walking around the Promenade Deck as well as time hanging out on our balcony. The Promenade Deck is also where the various Life Boats are kept and sometimes the larger ones are used to taxi passengers into ports. We will see both Humpback and Killer Whales today. We can also tell we are more near the cargo shipping lanes as we see all sorts of cargo ships as well. On this day we would spend the entire day at sea and do a little packing. When we went to bed the previous night, we were at 58 03.49N 134 53.28W and when we woke and check the system again around 7AM we were at 55 16.93N 134 14.20W. 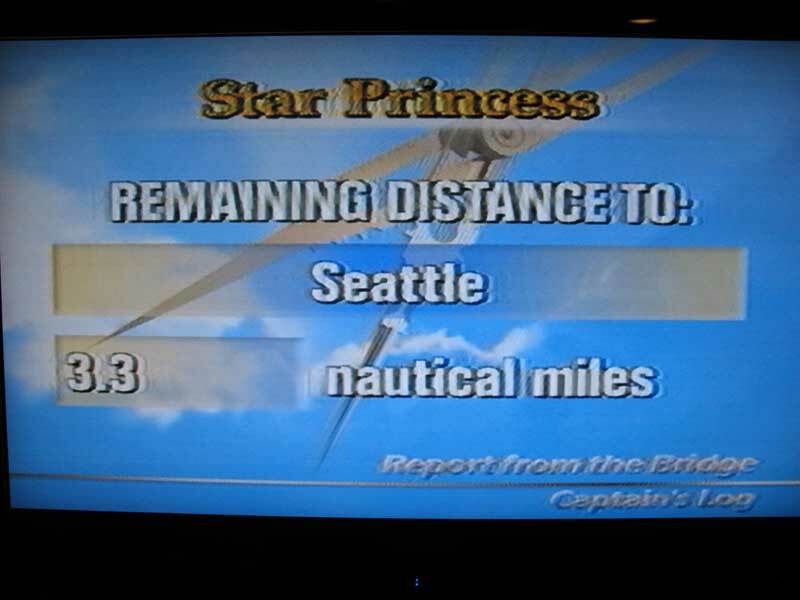 At this point we had sailed a total of 1461.1 Nautical Miles since we left Seattle, Washington. Since leaving Skagway, Alaska, we have sailed 257.7 Nautical Miles and we were still 635.0 Nautical Miles from Victoria, Canada which will be on the next blog entry. How might I know this information so exactly? 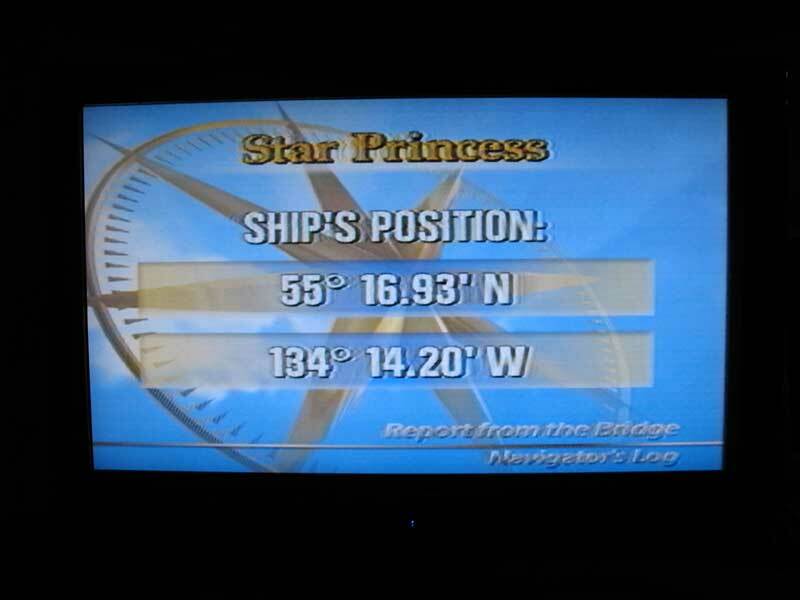 On of the channels on our room television is a constant ship information station and as part of that broadcast we get real-time navigation along with maps and all sorts of other information. After going up stairs to have breakfast, we return to our room around 9AM and the system now shows we are inside Canadian waters at 54 26.19N 133 51.29W and this is what the map shows. After having lunch I checked the system again at 1PM and we are at 53 15.16N 133 13.49W and this is what we see from out balcony. One thing they tell you is that Every DAY, HOUR, MINUTE, we are in Whale Country plus other things so try to always have your cameras ready. Around 7:30PM, I spot Dall’s Porpoise and try to catch a little video of them. We next reach our final Alaska Port-of-Call and as we make dock our ride is sitting there ready to be boarded. Yes, we are getting on-board the WP&Y (White Pass and Yukon) passenger train for a round trip ride to White Pass and Back. As soon as they say I can step out onto the platform I would run the video camera non-stop up to the pass as well as on the way back until I have to take a seat again when we re-enter the city. Once we returned to town we would do a little shopping including finding a Rock Shop Lisa was interested in to pick up a local mineral sample for her collection. As we head down the canal we will see all sorts of waterfalls and beautiful terrain along the shoreline. With our arrival in Juneau, AK our next “Shore Tour” was to board a Float Plane to fly over 5 Glaciers. Neither of us has ever been on this type of plane nor taken off / landed on water so we had no idea what to expect. Well, that was the smoothest flight we have ever been on. I would take video the entire time while Lisa took photos out her window; everyone on the plane had a window seat. Depending on what side of the plane you sat changed what order you saw things in but you would see the same things before the flight was over so take a seat and enjoy the view.